Lane Motor Museum's Meeting Room is the perfect setting for smaller corporate or private functions. Conducive to audio/video presentations, the room is equipped with a projector screen and podium with a built-in microphone. All other audio/visual equipment must be brought in by the rental client. The adjacent kitchenette is a convenient place from which to serve a light meal. Twelve 6 foot rectangular tables and sixty metal folding chairs are provided. No outside tables, chairs, or other large rental items (aside from av equipment) may be brought into the room. Rental fees include access to the exhibit hall area. Daily: The total rental fee is comprised of a variable room rate which depends on the day and hours booked plus admission per person. Evening: After hours Meeting Room rental rate is a flat fee starting at $1500. 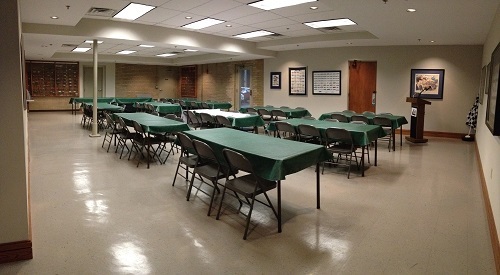 The Meeting Room can host up to 60 people for a seated event. No more than 60 people may be in the meeting room. To secure your reservation, a completed application and $100 security deposit are required.